MRCC reports Q2 2018 results this week and this article discusses what investors should be looking for, including signs of improvement in two of its portfolio investments. MRCC is my smallest positions as I have not been purchasing additional shares. In June 2018, MRCC held its annual meeting and shareholders approved the company becoming subject to a minimum asset coverage ratio of 150%, permitting the company to double its leverage. MRCC’s portfolio remains primarily of first-lien loans, representing around 86% of the portfolio as of March 31, 2018, which is generally favorable when considering higher use of leverage. 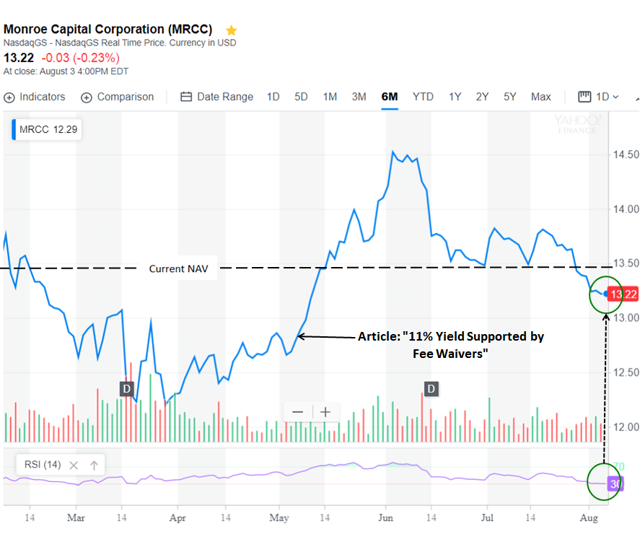 Monroe Capital (MRCC) is my smallest positions as I will not be purchasing additional shares “until there are signs of improvement or at least stabilization of its investments in Rockdale Blackhawk, LLC and TPP Operating, Inc.” as discussed in this article.